Dan gave me a huge gift this weekend. He sent me away for a weekend. Alone. Sort of a final fling before the baby is born. I headed out to my mom’s house on Saturday morning, after serving up donuts to the girls to soften the blow of my walking out the door, suitcases in hand. Usually, I feel like a zombie when I go somewhere without the girls. Like some part of me is missing, or I’ve forgotten something. It’s even to the point where I have to think through where my children are: "okay, Molly, your children are playing at their Pa’s house. You didn’t forget them, tear-stained cheeks, standing in the driveway." My mom and I shopped til we dropped. I spent all last week getting every lick of laundry in the house done and put away. (probably the third time in my career as a mother.) And I went through all the girls clothes, putting away the too smalls, so that I had a good list in hand of the things they needed. But the time away was wonderful. Watching too much TV, not having to squeeze my errands in between naps, eating dinner and only being faced with the decision of what time I’m going to bed, instead of the task of putting two girls to bed. I was also greeted by lots of gifts-a clean house and a fully-prepped baby room from Dan, ready to be painted. 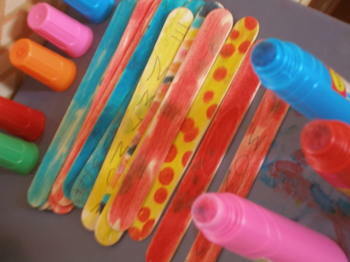 And lots of decorated hearts and painted popsicle sticks from the girls. And they’re still being churned out this morning. I have a tumbled-over pile on my desk. It feels good to go away for just a bit. But it feels even better to want to come home. Oh, you made me smile. I’m glad you got away, and I’m even more happy that home is such a wonderful place for you to return to… Have a great week with those darling girls of yours! Sounds like the perfect ending to the perfect getaway! What a considerate gift! so glad that you weekend away was lovely. and that the homecoming was even more so! Awww!How fun! I love that you aren’t finding out what you are having. Relax, enjoy the time you have left before baby comes and if baby comes before the carseat is bought, just have someone buy one before you go home from hospital. My son was early, so early I hadn’tpacked anything or installed the carseat. Off we went to the hospital and I just let everyone take care of me. We were supposed to move the next weekend and while I was in the hospital all our friends moved our stuff to our new place! When I found out I was pg with my daughter I pack for the hospital that week, lol! i am so happy for you molly! i love getting away, but i agree that coming home is even sweeter. so sweet- the time before the anticipated arrival of a babe is so wonderful. i’m glad you are enjoying it! Sounds like the best time EVER… both going away and coming home. What a thought-filled gift from your hubby. Glad you enjoyed it. Nothing helps you appreciate your family more than having a bit of a respite. What a nice treat. Those popsicle sticks look so summery. Don’t you love it when you can tell they missed you? ah…that was such a sweet thing to do. and those popsicle sticks,heehee,that is a cute collection! I love reading your blog – I found you through Melissa (wishes~dreams~love) and again through SouleMama. You’re a great inspiration to me! What a thoughtful prenatal gift! Some me time! Glad you enjoyed your time away & appreciate your return home! You’ll be so busy soon! You lucky woman you! Great to hear of your time off, I think I should drop some serious hints around here. Nice nice nice. Yup could do with some me time around here too! Well done. I am so glad you had your time. It sounds so delightful and you can tell in your words you feel refreshed. It probably feels like a load has been lifted and loose ends have been tied. oh, i loved reading this! Your Dan sounds like quite the thing, doesn’t he. So glad you had a lovely time away!